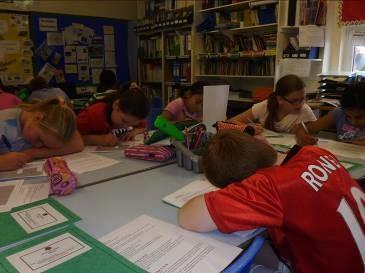 In Year 6 this week the children have been working collaboratively to gather research questions regarding WWII. 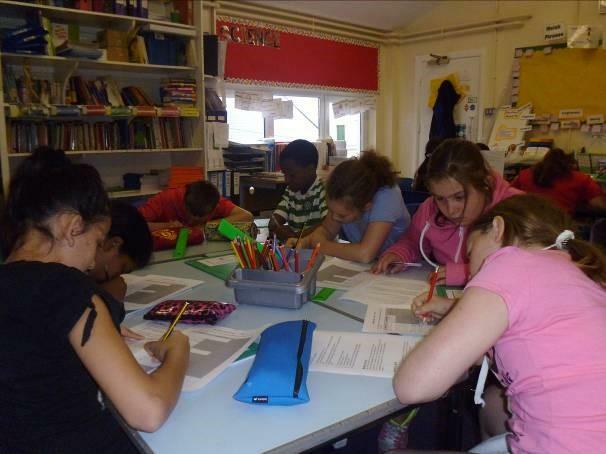 The children have decided upon areas they wouild like to research in the next couple of weeks. The children are going to create their own WWII project and present it in the form of a PowerPoint Presentation, E-book scrap book, newspaper or magazine. The children will work collaboratively to research and create work to add to their projects. 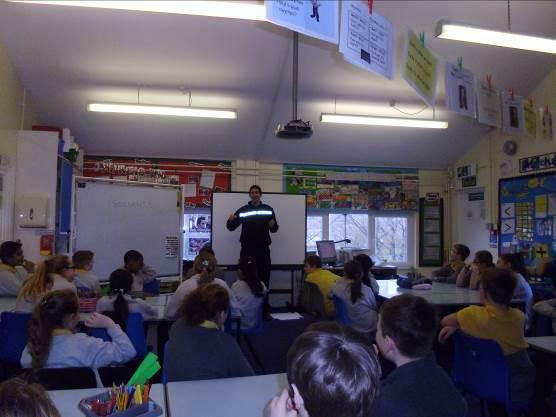 This week the children were visited by PC Mark. 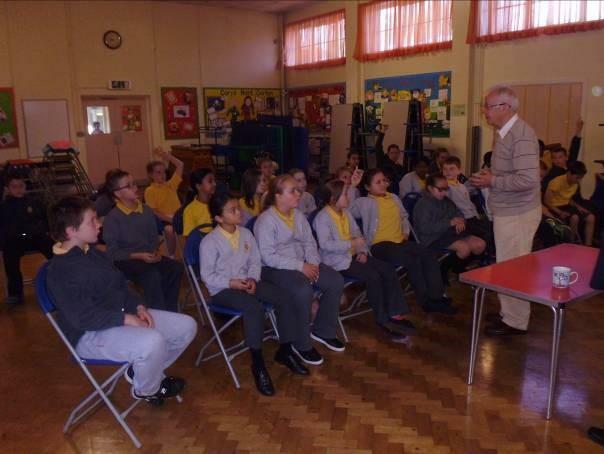 He gave the children a valuable talk about Drugs and Solvents. The children were very interested in the content of his lesson and worked well together to solve problems and tasks set for them. They had to use their thinking skills to organise cards in the correct order. Father Ambrose celebrated Mass with us this week. The topic of the Mass was ‘Sources’ with the main focus being the Bible as a source of reference for us in our daily lives. In maths this week we have been learning about financial matters. We have discussed profit and loss and we have been adding, subtracting and multiplying whole numbers and decimals involving money. The children have discussed the advantages and disadvantages of owning bank accounts. We addressed some misconceptions in the class such as what happens to our money if a bank should get robbed? The children have shown that they understand the word profit and are now going to try to help their parents to shop more effectively by recognising when a deal is not a deal in the supermarket! In Year 6 this week we have started our Transition project ‘Lets Fly!”. The children have been discussing various aspects of maths including calculating percentages, area of 2D shapes and the weight of objects. The children worked collaboratively to solve given problems using wipe boards and the children tutored each other to calculate the answers and explain their reasons. The next few weeks we shall be conducting science experiments and literacy tasks based around the topic of flight. In Welsh this week we have been practising our reading skills. The children have read a range of items including poems, books, stories and magazines to assist them in reading in Welsh. 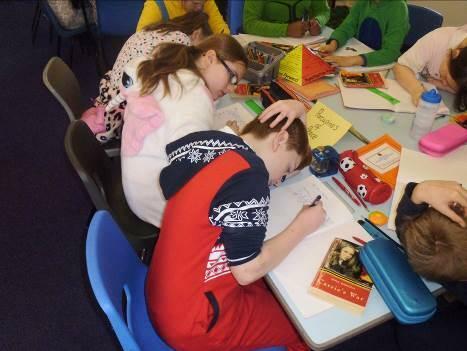 In SFA this week the children have been learning to write from another characters viewpoint. The children have been reading Carrie’s War by Nina Bawden – this week they have been empathising with the chracracter Nick and how he responds to presents given to him on his birthday. This week we also celebrated onsie day! The children looked fabulous in their onsies as did some of the staff. The money raised will help to fund a school in Uganda. We are proud of our school council members that have helped to drive this initiative! In Year 6 this week the children have been learning about the Sacrament of Ordination. The children have written about the Sacrament and some of us have created PowerPoint presentations to describe and explain the Sacrament. The children have used their ICT skills and Communication skills to good affect. In Maths this week Mrs Jones came back to work with us. 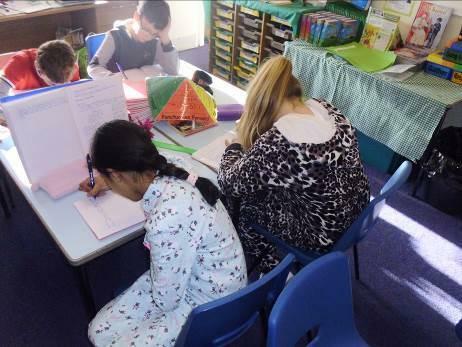 The children have been learning to find the difference between decimal numbers and to plot decimal numbers in order. The children have worked hard and enjoyed the interactive activities she shared with us. 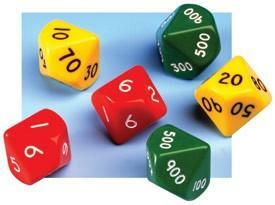 We have also been learning to multiply whole numbers and decimals numbers by 1 and 2 digits. When multiplying by 2 digits the children have to use long multiplication which some children are doing really well. Long multiplication is a level 5 skill. In our context work this week we have been using our mathematical skills to calculate the average temperature across the Brecon Beacons over a 1 year period. We used a range of data collected to produce pie charts, bar charts, graphs and tables. We have also conducted our own research based on the Brecon Beacons by asking Y5 questions and presenting the data in the form of a graph or chart. 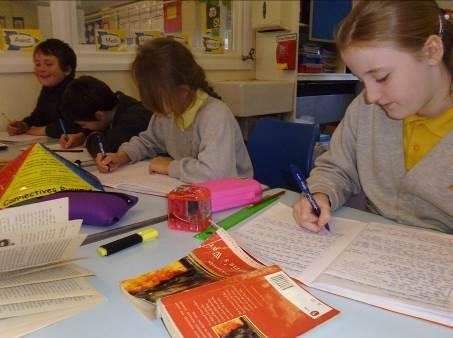 The children wrote remembrance poems in their books and on the laptops. The children also celebrated mass with Father Ambrose on the theme of being a peacemaker in our world. My God please comfort those who have died during the wars to protect their countries. Who had no protection at all. died in the wars especially comfort them today. In Religion this week the children have been learning about Vocations and the commitment people make in their lives. The children have designed questionnaires to ask about the commitment required to carry out various roles. The children have designed questions for a police officer, nurse and priest. Some of the children have been thinking about John the Baptist and his role in baptising Jesus. 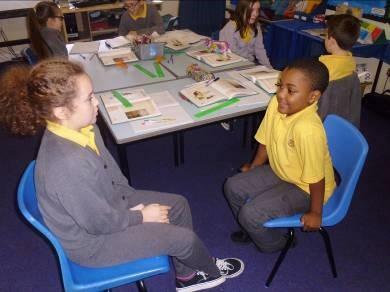 The children carried out a hot seating activity. They took it in turns to ask and answer questions in the role of John the Baptist. 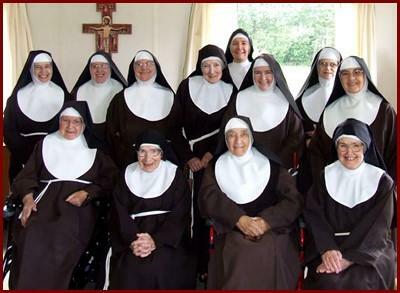 Some of the children have written letters to Sister Mary Anthony a nun within the Poor Clare Monastery - Rosminian Order in Glasgow. The children have asked questions regarding her commitment and calling to the order. The letters will be sent off to arrive in Glasgow early next week and hopefully we shall receive a reply very soon. In maths this week we have been learning to multiply 3 and 4 digit numbers by single digits. 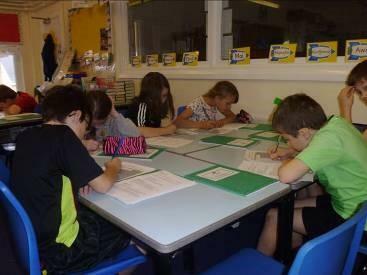 Some of the children have begun to The children have used the magic stick to learn the eight times table. The children have also been learning to multiply decimals by 10 and 100. The children have used place value boards and sliding place value boards to recognise that when multiplying by 10 the numbers sift one place to the left and when multiplying by 100 the numbers shift two places to the left. 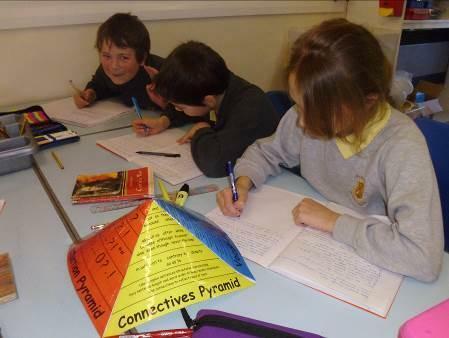 In our context work this week the children have been writing non chronological reports regarding the Brecon Beacons. The children have used a range of sources to locate, use and record information. The children researched using the Internet and read through various pieces of given information. In Religion this week the children have been looking at passages of scripture that show God’s unconditional love for us. 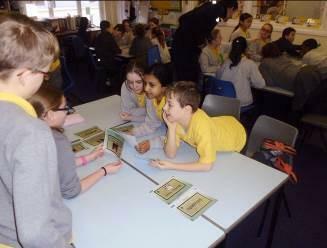 They have also looked at the 10 commandments and discussed the commandment to love thy neighbour and what that means to us in the modern day and particularly in school. In SFA this week the children have continued to read the Novel The Firework Maker’s Daughter. The children have also written poems about their teachers as part of a poetry competition being held across the consortium. Well done to all those children that have logged in online and read some of the books on the Bug Club website. www.bugclub.co.uk The Bug club books are interactive and test the children’s comprehension skills too. There are many books to read as part of the e-readers scheme. Dai awn diolch blant! 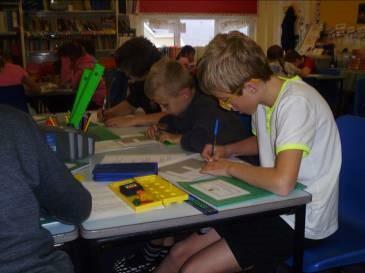 This week in Year 6 the children have taken part in a project involving magistrates. The children took part in a mock trial and had to deliberate to make a decision as to whether the defendant was guilty or not. The magistrates talked about their role they play in administering the law. 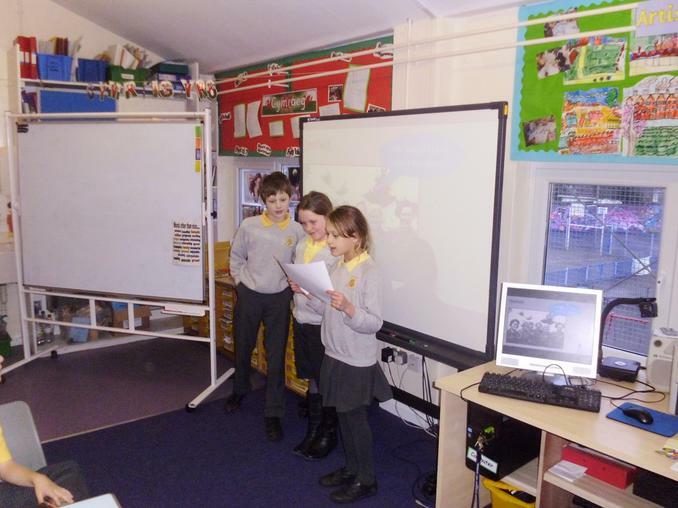 A range of children across the class had the opportunity to play a role in the mock trial. The children were given scripts to follow however the defendant’s sentence was discussed as a class. The children found this very interesting and thoroughly enjoyed the experience. In ICT thi s week blwyddyn chwech have been using the Ipads to explore apps that will help them to create their very own e-book. 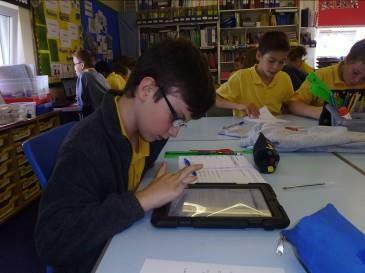 The children have been using the apps to create talking characters, create comics and also to make their own animations.